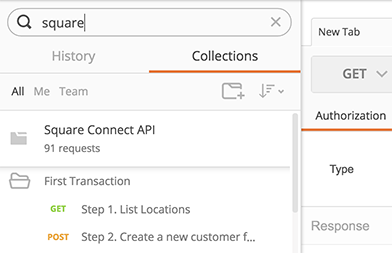 This topic describes the tasks you can perform from the Collections tab in the sidebar. Click on a collection to show or hide the requests that comprise the Collection. Use the up and down arrow keys on your keyboard to navigate through the collections. Expand the arrow (▸) to show the details view for the collection. Collapse the arrow (◂) to hide the details view. You can add metadata like name and description so that all the information a developer needs to use your API is available easily. Click the "new collection" icon on the top right, or save a current request to a new collection. Collections can be sorted either alphabetically by name or by when they were last updated. To do this, select the "sort" icon on the top right and select Sort by name or Sort by date. If you're working on a few collections in particular, you can click on the star icon to bring the collection(s) to the top of the list. If you have a lot of collections, filter collections in the sidebar using the search input field. Click the ellipsis (...)next to a collection, and select "Delete". If you didn't intend to delete the collection, you can always recover your deleted collections. Refer to the next section Recover a collection to learn how to retrieve your deleted collections. The Trash feature is available only for the signed-in users. So, if you are not a registered user you'll still see the Trash option but as a disabled one. Note: Postman offers different recovery plans for Free, Pro and Enterprise users. Users on Postman Free license can recover one-day old collections. 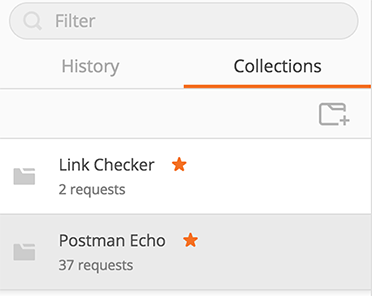 Users on Postman Pro license can recover collections up to 15-days. 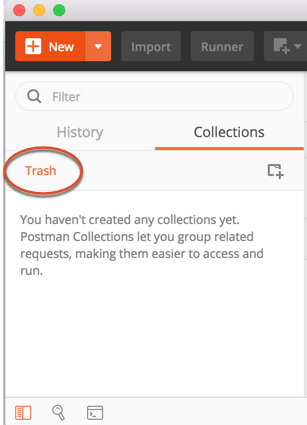 Users on Postman Enterprise license can recover collections up to 30-days. If your collection seems deleted and you are not able to recover from your deleted collections list, it is possible it is removed from a workspace rather than deleted. To check, navigate back to the main page of the web dashboard, then click View all collections. If listed, you can click on its share icon to move it back into a personal or shared workspace. If you'd like to revert your collection to a previous state, you can do so by leveraging the collection's in-app activity feed. To share a collection, see sharing collections. 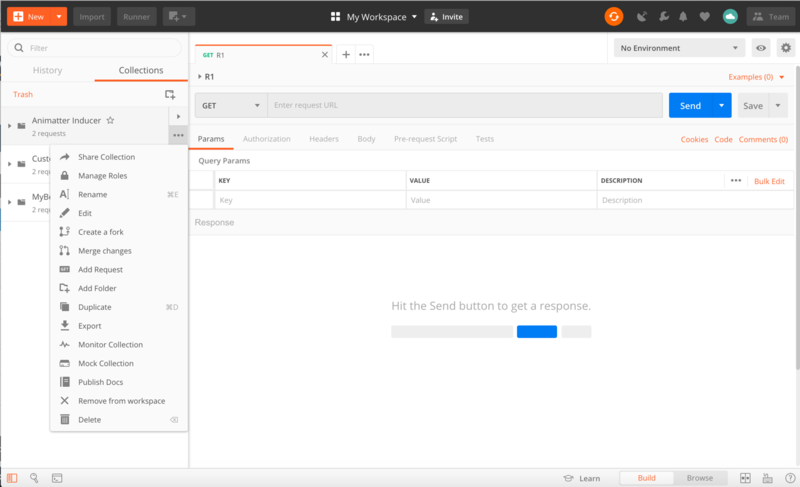 Within a collection or folder, you can reorder requests using drag and drop. You can also reorder folders within a collection using drag and drop. Requests can also store sample responses when saved in a collection. With examples, you can mock raw responses and save them to a collection. 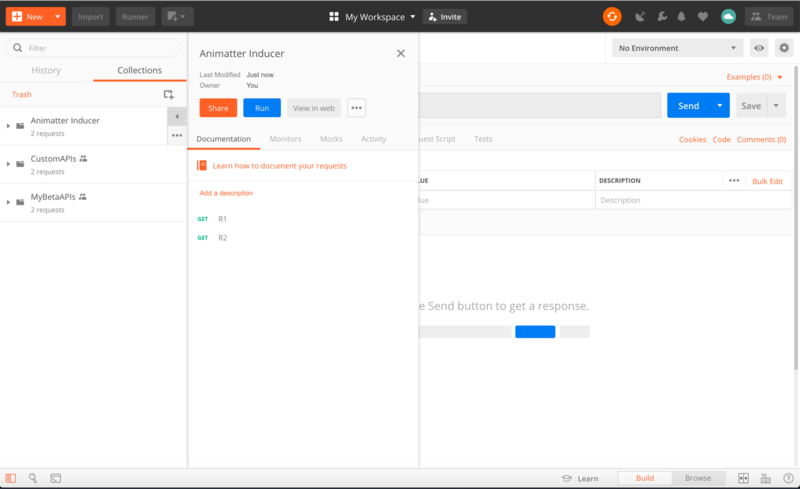 Then, you’ll be able to generate a mock endpoint for each of them using Postman’s mock service. Requests stored inside a collection can contain scripts to add dynamic behavior to the collection. Folders are a way to organize your API endpoints within a collection into intuitive and logical groups to mirror your workflow. Next to the collection to which you want to add a folder, click on the ellipsis (...) and select "Add Folder". Add a name and description to the folder. The description is reflected in your API documentation. You can add deeper levels of nesting for folders. Drag and drop the folders to reorder them to create the ultimate customized folder structure.